One of the darkest stains on Roy Keane's soccer career was his horror tackle on Norway's Alf-Inge Haaland in April 2001. It was a premeditated attack on a fellow professional footballer that arguably shortened the Norwegian's football career. The origins of the incident can be traced back to 27 September 1997. It was two months after Roy Keane had been handed the captaincy of Manchester United by Alex Ferguson. During a major drinking session on the previous Wednesday night / Thursday morning (4:30am) Keane became involved in a drunken brawl with his favourite sparring partners - Dubs. As he admits in his autobiography he was "...in no shape at all. "[Page 171]. He hadn't had enough sleep and was in emotional turmoil. In his next match on that Saturday against Leeds United at Elland Road Roy Keane was not physically of psychologically fit to play. 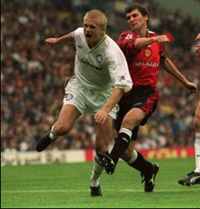 In his autobiography Keane complained that the Leeds United player, Alf-Inge Haaland, had been baiting him for the whole match. Something he must have encountered many times before during his career. Indeed earlier in his autobiography relates a similar situation in which Eric Cantona found himself against Crystal Palace in the 1994/95 season, "It's niggly stuff, not nasty. Shirt-pulling, obstruction, a bit of chat. Stuff you shouldn't bother about, but the purpose is to break your concentration - and with Eric it can work. "[Page 138]. Obviously it could work with Roy Keane also. There were about five minutes to go and Manchester United were 1-0 down. While his colleagues were chasing the match Keane chased Haaland into the Leeds penalty box. Without any serious prospect of getting the ball Keane kicked out at Alf-Inge Haaland. First Keane kicked out at Haaland with his right foot. Presumably not having made sufficient contact with the Leeds player, he then had a go with his left foot. Keane says in his autobiography; "I was trying to trip him up rather than kick him. I knew it probably mean a booking, but f**k it..."[Page 172] Keane's studs caught in the Elland Road turf causing his cruciate ligament to snap. In his crude attempts to foul Alf-Inge Haaland he had caused himself a career-threatening injury. To add insult to injury Keane was booked by the referee for his attempted foul on Haaland. Haaland, who can't have been aware of the extent of the injury, particularly since he was the one that had been fouled, stood over Keane telling him get up and stop faking injury. Even in his extreme pain Keane was aware of this and vowed vengeance. Although Roy Keane believes that his cruciate ligament injury helped him to reform his life and to have a greater appreciation of what was left of his career he still harboured a grudge against Haaland. Now a Manchester City player, Haaland and Roy Keane shared a soccer pitch, for the first time since the cruciate injury, again on 21 April 2001. Carrying a lot of frustrations about Manchester United's poor performances, particularly in Europe, since winning the treble in 1999 Keane was an angry man. His frustration was compounded as City grabbed a late equaliser in the match. With a few minutes to go Keane got his opportunity for revenge on Haaland. far touchline. Alfie was taking the piss. I'd waited long enough. I f**king hit him hard. The ball was there (I think). Take that you c**t. And don't ever stand over me again sneering about fake injuries." Keane knew exactly what he was doing and hardly waited for the referee to send him off. As Keane made his way off the pitch, Keane stood over the injured Haaland berating him. Haaland was extremely lucky that his foot was off the ground when Keane's boot connected with his knee otherwise the injury could have been much worse. Although it has not been proven conclusively that this tackle finished his career Haaland never played a full professional football match again and retired in 2003. Keane has never expressed any remorse for what he did and does not appear top see anything wrong in his actions. Roy Keane suffered a career-threatening injury while trying to needlessly foul Alf-Inge Haaland. Because Haaland, not unreasonably, accused him of faking injury Roy Keane waited three years to deliberately inflict a serious injury on a fellow professional footballer. And even with the benefit of hindsight Keane still feels justified in what he did. Why is accusing Roy Keane of faking injury such a major crime? Both Roy Keane / Alf-Inge Haaland incidents can be viewed below courtesy of YouTube.